Marinate the 8 thin chicken breast cutlets in a large bowl with all of the ingredients beginning with the garlic through the black pepper; set aside for about 20 minutes while you prep the remainder of the meal. Prepare the Tangy Mustard Vinaigrette (recipe below), and set aside. In a medium bowl, add the chopped kale and chard greens, about half of the sprouted Kamut (or regular sprouts), and all of the quartered cherry tomatoes; set the salad aside in the fridge to keep cold until ready to serve with the Parmesan Seared Chicken Breasts. To sear the chicken breasts, add the grated Parmesan cheese and the Panko breadcrumbs to a clean plate and toss together, and lightly dredge each cutlet in the mixture; once all cutlets are lightly dredged, place large, non-stick pan over medium-high heat, and add a few drizzles of canola oil to coat the bottom of the pan; one the oil is hot, work in batches searing the chicken, allowing the cutlets to become golden-brown on each side, roughly 3 minutes per side; keep the chicken warm until you’re ready to serve it. Toss the kale and chard greens/salad with the vinaigrette. 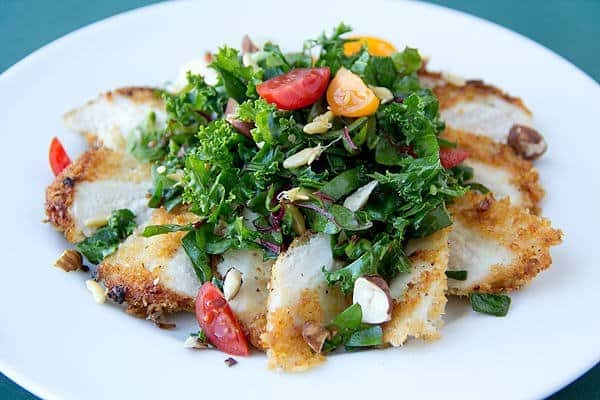 To plate, slice each of the Parmesan Seared Chicken cutlets on the bias, and add two of the sliced cutlets to each plate; top with a generous handful of the greens/salad; finish with a sprinkle of the remaining Kamut (or sprouts) on top of each, as well as a sprinkle of the chopped toasted hazelnuts. In a small bowl, whisk together all of the ingredients from the garlic through the lemon juice to combine; slowly begin drizzling in the olive oil, whisking, until well combined and emulsified; set aside until ready to dress to greens.